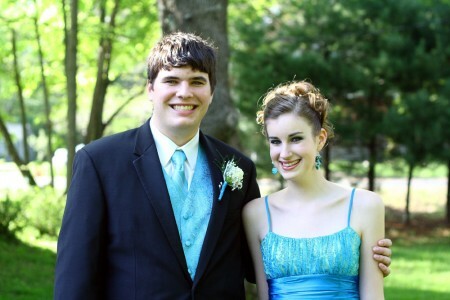 Hannah’s boyfriend, Rob, is a senior so last Friday night they went to his prom. There is no grand march and no prom queen so it was all rather anticlimactic after the last prom event. And yet, she still looked beautiful. Last time she channeled Cinderella. This time it was Tinkerbelle. Rob was pretty pleased to be taking the former prom queen to yet another prom. They looked fabulous together, I think. The hairdo was a bit different this time, being a twist and all, but still beautifully done. And they enjoyed themselves – which is all that really matters. This, to me, was the shot of the day. Oh, to be young! That last photo is truly priceless! She’s a beauty, inside and out. They are so cute together – and she is just beautiful. I am sending my son to the prom next week – not as much fun shopping for a tux, but I am excited for him. How cute is that photo??!? She looks just beautiful in that dress too! I’d kill for her legs. Srsly. You captured a carefree and joyful moment. Thanks for sharing, it is a beautiful photo. So sweet! Did you do her hair? Hannah looks stunning. I’ll bet they had tons of fun. Yes, that is a great shot! Hannah looks so beautiful again. That’s another wonderful dress. Which dress does she like better? That last picture of them is great! She looked beautiful, yet again. I am glad the weather cooperated this time. Another home run. When did she turn into such a beauty? I blinked, and she grew up! Wow, the hairdo is gorgeous (as she is). I think “willowy” is the word. That last picture is great. They both look so happy, not to mention fabulous. We just returned from Disney World in Orlando, where they are now featuring a boutique for little girls. They do a princess make-over for the day, and a photo shoot. Hannah is what they all wish to grow up to be. Lovely! She is such a beautiful child. You must be having much vicarious fun in all this! Don’t need to be young again. 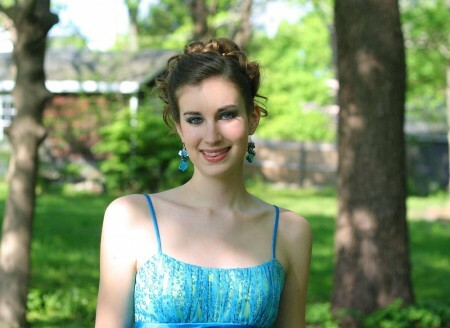 Hannah looks beautiful! What a cute dress! what a season!! look at those smiles. Please tell me if does not go by that fast! I will be proud to know that I knew Hannah, when she goes on to go great things – famous model, or something else! They are so cute! Great pictures….but she is one photogenic and beautiful girl! She is beautiful! Looks like they had a fun time. All the photos look great. Great hair, dress. Your daughter looks spectacular. Wow. Two proms. I’m happy I got my daughter outfitted up for one. Also, great job on matching the vest/tie to the dress. They do look happy together. Young and beautiful! That’s a great shot! Love that last shot…how neat to be that young and enjoying life! She looks beautiful and he looks very handsome! So adorable. I love that dress on her, and even better, it looks like she is having so much fun.You must have been smiling just as much. I love the last photo! Youth is so short that it truly is wonderful when we see our children enjoying themselves. Oh, to be young indeed… but only if I can take what I know now back with me. Rob looks great and very pleased to be escorting such a gorgeous young woman. May she always be that happy! Adorable as always. How cute they are both together. Omigosh, they are so adorable! The last picture looks like it’s right out of a magazine! Such a lovely girl. AND a cute date, too!